Gatherings: The group of leaves formed when a single printed sheet has been folded into the leaves which will appear in the finished book. A series of these gatherings, arranged in the proper order, are then stitched together to form the Textblock of the book. See Figure 14. 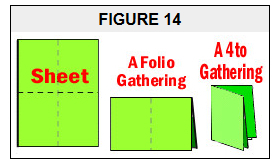 The term is also used in the plural to reference the entire series of individual gatherings prior to binding. Glassine: A translucent, smooth, lightweight, dense paper which has been coated with silicon (or a similar agent that inhibits adhesion to another surface) and intensely calendered (smoothing between rollers). It is greaseproof and and moderately resistant to the passage of moisture and air. 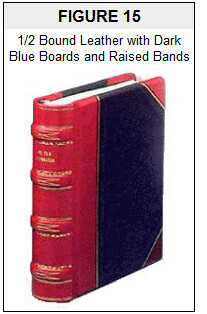 Most commonly used for food packaging and holding stamps, occasionally it make an appearance as a Dustjacket. Gilt: A thin layer of gold, or something with the appearance of gold. Gilt Edge: Gilt has been applied to the specific edge(s) named. Gilt-Lettered: Lettering which has been printed by Giltstamping. Mostly found on the front cover and spine giving the title and author, books will occasionally be found with decorative text printed in gilt, such as title pages, chapter heads, etc. Giltstamped: While this term originally referenced the literally stamping of gold foil into a book's leather binding, it now describes the appearance of having this earlier decorative technique on leather, cloth or board bindings. Essentially, it a blindstamping with the addition of a gilt-colored substance. See Figure 7 and the spine of Figure 15. Glossy: Used to described the bindings or covers of books bound in both Wraps and paper-covered boards which have been Laminated. Gutter: The trough formed by the adjacent inner margins of facing pages in a book. See Figure 5.